Having one section of lawn that does not have the same vigor as other sections -- even though it receives the same amount of care and sunshine -- is a common problem. In some cases, the lack of vigor is due to hard soil, which is compacted soil. Particles in compacted soil are pressed so tightly together that they starve the grass of air, nutrients and water. Whether the soil compaction is from a high clay content or heavy traffic, it can be fixed and maintained to meet the ideal growing conditions for grass. Collect 3-inch-deep soil samples from 10 to 12 areas of your yard by using a spade shovel. Mix the soil samples together. Put 1 cup of the mixture in a soil sample box, and take the box to your county's Cooperative Extension Service office for testing. Till the amount and kind of fertilizer recommended in the soil test results into the top 10 to 12 inches of soil. Loosen the soil to a depth of 6 inches with a rototiller when the soil is dry. Till compost into the soil to a depth of 18 inches, using an amount of compost that weighs the same as 25 to 50 percent of the soil. Level the amended soil with a rake. Divide the total amount of grass seed you will use into two equal halves. Sprinkle one-half of the grass seed in one direction on the soil surface, and sprinkle the other one-half of the grass seed at a right angle to that direction. Plant cool-season grass -- such as tall fescue (Festuca arundinacea) -- in fall when the average daily temperature is about 75 F or in winter when the soil's average temperature is under 40 F. Plant warm-season grass -- such as bermudagrass (Cynodon dactylon) -- in late spring to early summer. The tall fescue variety "Proscape Winning Colors" (Festuca arundinacea "Proscape Winning Colors") is hardy in U.S. Department of Agriculture plant hardiness zones 3 through 6, and bermudagrass is hardy in USDA zones 5 through 10, depending on the strain. Blend the seeds into the upper 1/4 inch of soil with a 3/4-inch-thick piece of plywood that has 10 to 16 large nails driven though it. Pull that tool through the lawn three or four times. Soak the soil to a depth of several inches with water, and keep the soil consistently moist until the seeds germinate. Apply a thin layer of aged straw or hay mulch on the soil surface, using about one small, square bale of aged straw or hay per 1,000 feet of soil surface. Water the seedbed during warm weather several times each day, and do not let the grass seedlings dry out. Apply enough water to moisten the seedlings' root zones in late evening and early morning as the seedlings mature. About 1 to 1 1/2 inches of water are needed for a 6-inch-deep root zone. 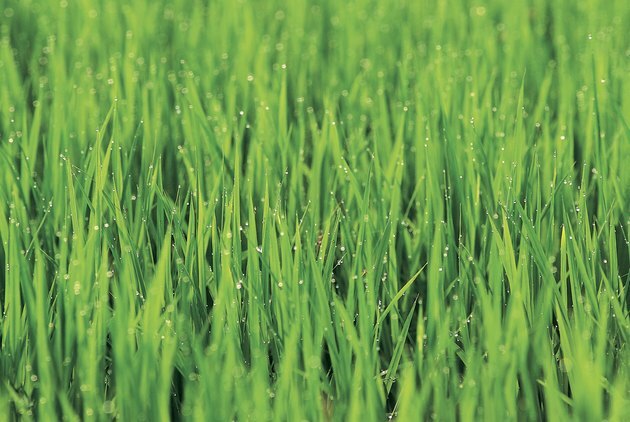 Fertilize the grass with 4 to 6 pounds of a slow-release, nitrogen fertilizer, divided into four separate applications applied throughout the year. Apply 1/2 to 1 pound of the fertilize per 1,000 square feet of lawn surface about every eight weeks in fall, spring and summer, starting during the growing season. Mow the grass when it is about 3 inches tall by using sharp, new lawn mower blades, cutting cool-season grass to about 2 inches tall and warm-season grass to a height of 1 to 2 inches. Continue mowing the grass often enough so that no more than one-third of each grass blade is removed at any time. Aerate the soil with a core aerator up to two times yearly: during periods of active growth -- except in spring -- and when the soil is dry. Remove cores as deep as possible, which is about 3 inches deep.